The first of the seventh generation Colts appeared in August 2004 and featured the controversial Olivier Boulay designed "corporate face". The MY04 spec Colts were powered by the 1.5 Litre 4G15 MIVEC engine with INVECS III CVT transmission. The MY04 was only available in hatchback body style in LS and XLS trim styles. Fuel consumption was stated at 6.4L/100Km combined cycle *ADR 81/01. The LS featured electric power steering, anti-lock brakes with brake assist and electronic brake force distribution, CD player, driver and passengers airbags, air conditioning and power windows with side and curtain airbags and metallic or pearl paint optional. The XLS added 15" alloy wheels and a body kit to the LS with the addition of an electric sunroof to the option list. At the beginning of 2006, Mitsubishi released a revised model of the RG Colt with a new 1.5 litre 4A91 MIVEC engine, boosting peak power at 6000 rpm from 72kW to 77kW and reducing the combined cycle fuel figure to 5.9L/100Km. Trim levels were changed with the ES as base model, LS and VR-X in addition to the Cabriolet, Ralliart and Cabriolet Turbo models. A 5 speed manual transmission became the standard transmission, with the INVECS III available as a $1500 option on the ES, LS and VR-X. The Ralliart and Turbo used a turbo-charged version of the 4G15 with the Ralliart outputting 113kW at 6000 rpm and 210 Nm at 3500 rpm while the Cabriolet Turbo output 110 kW at 6000 rpm and 210 Nm at 3500 rpm. All models added a MP3 capable CD player and pollen filter on the air-conditioning. The styling of the Colt was also changed with a new grille and front bumper bar. 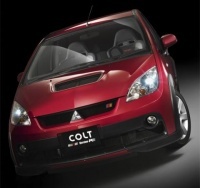 The refreshed Colt from August 2007 had a cross-hatched style grille to distinguish it from the previous MY06 style. The trim levels were again revised with the ES, VR-X, Cabriolet, Ralliart and Cabriolet Turbo being the only levels available. The ES added 14" alloy wheels and a rear spoiler to the standard equipment list. This page was last modified on 9 September 2015, at 04:19.